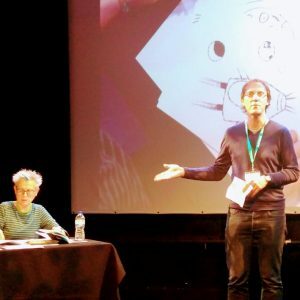 Last saturday I packed up some of my children’s books and headed to the Half Moon Theatre in Limehouse, London to join authors/illustrators Bridget Marzo, Robert Glenny and Layn Marlow for an afternoon of live drawing. Our work (and books for sale) was on display in the theatre’s foyer with that of other SCBWI members – part of a Pictures at Play exhibition. 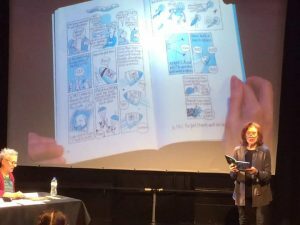 The actress Linda Marlowe read from our books, and we took it in turns to draw, helped by suggestions from children in the audience. 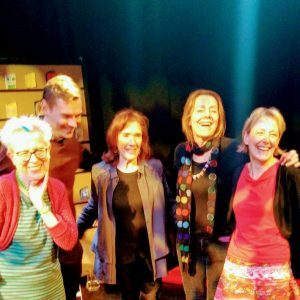 I supplied some spacecraft (as you do) for children to add their crew, charming director Chris Ewell organised us, Linda was brilliant – especially her sound effects for my comic strip extract – and the audience was lively. 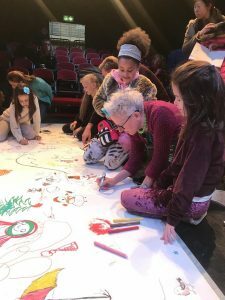 Later we all took part in a massive big draw. What fun! 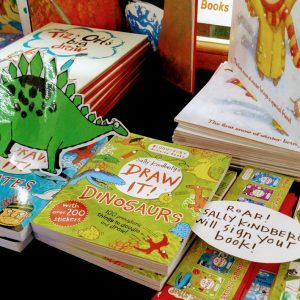 This entry was posted in Books, Drawings, Events and tagged authors' events, Bloomsbury Childrens Books, book signing, Bridget Marzo, Draw It! Dinosaurs, Draw It! 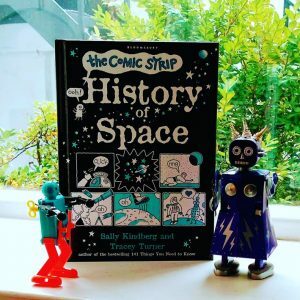 Pirates, events for children, Half Moon Theatre, Layn Marlow, Limehouse, Linda Marlowe, live drawing events, Pictures at Play, Robert Glenny, SCBWI British Isles, The Comic Strip History of Space. Bookmark the permalink.